Summary (from the back of the flap): "We went to the moon to have fun, but the moon turned out to completely such." So says Titus, whose ability to read, write, and even think for himself has been almost completely obliterated by his "feed," a transmitter implanted directly into his brain. Feeds are a crucial part of life for Titus and his friends. AFter all, how else would they know how to get bargains at Weaterbee & Crotch, or how to accessorize the mysterious lesions everyone's been getting? But then Titus meets Violet, a girl who cares about what's happening to the world and challenges everything Titus and his friends hold dear. A girl who decides to fight the feed. Review: I read this book because my brother (a big science fiction fan) told me it was so good. I had no idea what it was about and didn't even read the summary first... kinda' radical, no? This book is definitely one where you have to get used to the way it's written and that takes a little time. That isn't a bad thing, just an observation. Characters can have conversations that are spoken (no quotation marks appear in the text) or they can "chat" someone (shown in italics), which means they don't actually speak aloud. The main character's thought flow and the narration of the story are also interrupted by his feed telling him information (also shown in italics). It all feels a bit sensory overload as you read, but that's the exact point. These people's lives are constantly being barraged by information from their feeds: mostly what to buy, how much it costs, what color it comes in, and how happy it will make them to buy it. Basically they have the Internet implanted in their brains. They go to school, but only to learn how to use the feed. They don't need to learn information or how to think because they can just look up stuff up on the feed as they talk or walk around. This book is a brilliant comment on the direction our lives are going in regards to thinking for ourselves and being barraged with images/ideas that come from our online searches. Today our Internet searches are cached by advertisers who then tell us about products they think we'll like based on what websites we go to. In Feed the same thing happens only it's inside their heads! Although Titus and his friends aren't necessarily people I would want to spend time with, they are characters that are done really well. Once I got used to the cadence of their speech and the fact that they were spending spring break on the moon (and winter break on Jupiter) I realized they were dealing with the same issues that students deal with now: going to school, having friends, finding parties, dating, etc. Then they meet Violet who didn't get a feed until she was 7. Her parents don't have feeds. She reads "dead" languages and studies history. She seems like a freak. And something is terribly wrong with her feed so she acts differently from everyone else. What does it mean to purposely "mess with" your feed? You'll have to read to find out! Okay, I'll bite. I have put this on hold at my library, which has one copy in the system. I already think people are "fed" by the constant media blitz to think alike. Now I want to find out about Violet, since I "messed with my feed" by choosing to go without a television. Several times a week I'm asked about "that ad on TV" or "that story on the news last night," and when I say I don't watch television, they don't believe me and describe it more clearly so I'll "remember" it. I still get my news by reading, though not a printed newpaper. I read widely, including the Guardian in Britain, the New York Times, Yahoo News, and googling what I pick up on. I am not limited to a 15-second sound byte. I really loved the concept behind this book when I read it. I think it would be a great read in high school as a way to discuss how technology is lowly taking over our lives. Bonnie--you're going to like this one and totally see where it is coming from! Think Google. 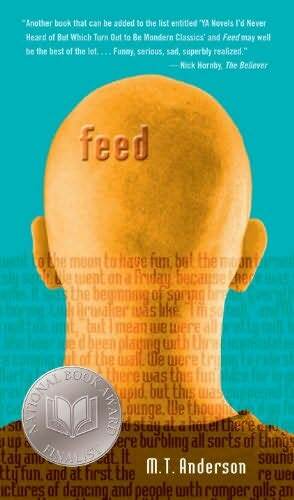 Allie--I don't know that many people who have read this one and I am really excited to recommend it to students! Sounds like a modern day Orwellian situation. People taking over your minds so you can't think for yourself anymore even though you're capable. It is soo terrifying. I would totally be that girl trying to fight the feed! I must read this book! Thank you for sharing about it! Great review! I felt the same about not really feeling like you'd want to spend time with most of the characters but finding them well-written. I really liked the story, and I'm a sucker for endings like the one this book has. Bonnie - we haven't had television for years, which is totally opposite of how I grew up, and I get that "did you see" pretty much any time I call home. I think I probably felt closer to Violet because of that. Topher--no TV... can't imagine, but good for you! I didn't have one until I was about 10 so I get the "do you remember" and I don't (soldiers coming home from Vietnam, Nixon resigning, moon landing, etc).